The DE SANGOSSE group strengthens its strategy of development in Latin America thanks to the creation of a new subsidiary in Mexico (Mexico City). Mexico was the country chosen to open our third subsidiary in Latin America. The DE SANGOSSE group is already represented in Latin America by its subsidiary DE SANGOSSE Latin America located in Argentina (Buenos Aires) and with DE SANGOSSE Agroquímica in Brazil (Curitiba). The Argentinian subsidiary distributes our products in several Latin American countries such as Argentina, Chile, Bolivia, Paraguay, Uruguay, Equator and Colombia. The strategic position of Mexico in Latin America is a key element to expand the business of our products on this continent. Indeed, with this new subsidiary in Mexico, DE SANGOSSE will respond to the agricultural needs for Central America while DE SANGOSSE Latin America will market crop protection and plant nutrition products in the rest of the continent. 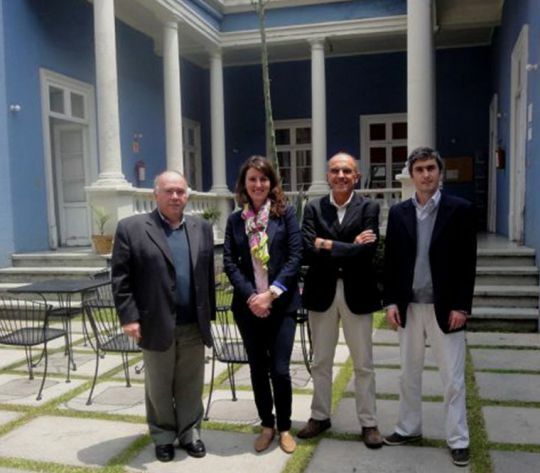 From left to right: Domingo Montaño, Manager of DE SANGOSSE Latin America, Alice Rebert, Director of Recruitment and Training for the French-Mexican Chamber of Business and Industry, Jean-Luc Larradet, international DE SANGOSSE Consultant, Juan Calandri, Business Manager of DE SANGOSSE for Northern Latin America. The creation of the subsidiary in Mexico strengthens the position of the DE SANGOSSE Group in Latin America and provides easy access to our products from any country on the continent.